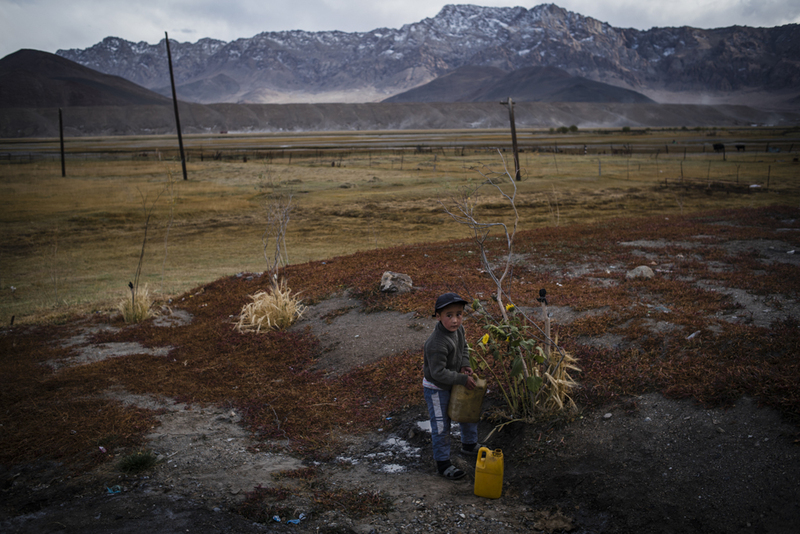 In this distant and isolated corner of Tajikistan, the words have a cruel edge. The roads are in ruins, the local hydropower plant lies idle, employment is sparse and basic staples are barely affordable. It wasn’t always this way. Landing on a precise figure for Murghab’s population is tricky. The number of residents may be as small as 7,000 now that so many have left. 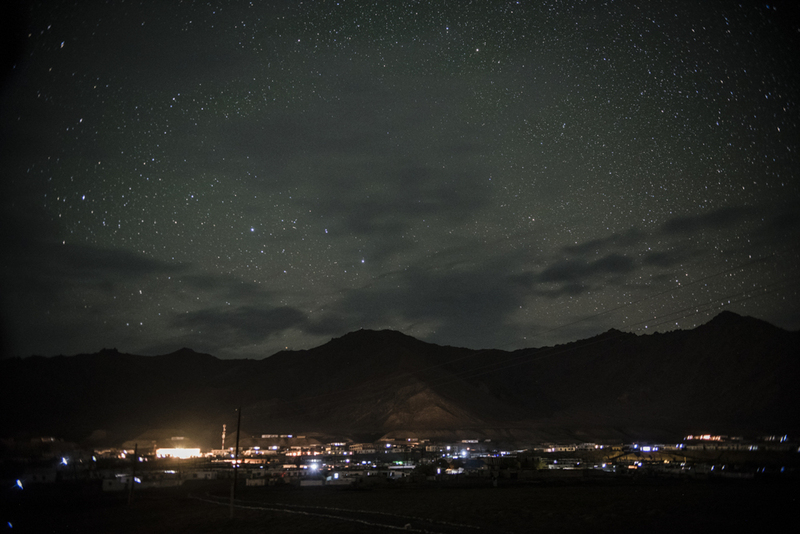 Although they live far from the central government authorities in Dushanbe, the people of Murghab are nervous about speaking openly of their hardships for concern they will get into trouble. The government is deeply anxious about the prospect of discontent in the country’s periphery. All Murghab interviewees have been provided pseudonyms to avoid potential for retribution from the authorities. The nearest mid-sized town is Khorog, some 300 kilometers (190 miles) drive away. The distance separating Murghab from either China or Afghanistan is far shorter but interaction with either is negligible. Roads are so poor that the trip from Khorog can take anywhere between six and eight hours. Passengers in shared taxis endure a trial of spine-bruising jolts. At night, car headlights provide the only illumination. It was more than a decade after the Bolsheviks seized power that they began building viable connections to Murghab. The writer Pavel Luknitsky, a friend and colleague of the poet Anna Akhmatova, describes getting to the town by vehicle in 1931 as part of a test voyage into the mountains. “The geologist [Georgy] Yudin and I were fervent proponents of using automobiles as part of our expedition. And we had strong arguments in our favor. In 1931, we left Osh for the Pamirs together with a caravan of Pamiri border guards who were charged with installing border posts where there were none, and to fence off the state frontier. The head of the Pamir border guard detachment, having taken our idea onboard, risked taking two trucks to the Pamirs. We decided they would travel under their own steam until such time as insurmountable obstacles forced us to dismantle them and load the parts onto camels. Our remarkable drivers, Goncharov and Stasevich — regular drivers from Andijan — conspired not to allow their trucks to be dismantled come what may. They drove ahead of the caravan and waited at night lodgings. The obstacles were numerous … On July 14, 1931, both vehicles arrived in Murghab, intact and in decent condition. It was the first time it had happened in the history of the Pamirs. I was present at a fabulous celebratory welcome laid on for us by the people of the eastern Pamirs. Both vehicles remained there and were successfully put to work in the Pamirs all summer and fall until the passes were closed,” Luknitsky wrote in his 1955 memoirs, Travels in the Pamirs. For the arriving outsider, the chronic lack of electricity and thin air are the first tests of acclimatization. Oxygen is so sparse here at 3,600 meters (11,800 feet) that even a brief stroll is enough to cause shortness of breath. Flooding hit Murghab in 2015, causing serious damage to the hydropower dam that had served as the town’s only source of electricity over the past quarter century. When evening descends, the deathly silence is broken only by the whirring of diesel-powered generators. On clear days, solar panels top up the reserves. Local administrative offices are equipped with computers, many still in their boxes. Since there is so little power, they are of little use. The police department keeps in touch with colleagues with mobile phone apps like Viber and WhatsApp. Phones are recharged in the small window of time when the generators are running. Almost all the $10 million being spent on repairing the Aksu-1 hydropower plant has been stumped up by the German government. After rebuilding, which is scheduled to finish before next winter, Aksu-1 will be able to generate up to 1,500 megawatts, more than doubling its previous 600-megawatt ceiling. 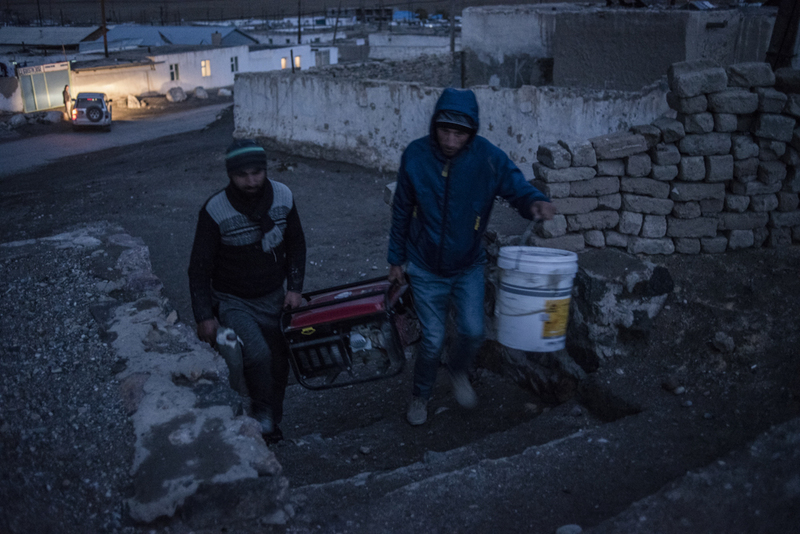 It is only houses in Murghab itself that will get electricity from the power generator, though, since there are no lines in place to supply nearby villages. In any event, hydropower is by definition seasonal and will not provide a complete solution. For heating, households rely heavily on teresken, a spidery and stumpy shrub that grows in the wild and burns at intense temperatures. Owners of livestock supplement this fuel with desiccated animal dung. Scientists have warned that widespread uprooting of this slow-growing plant threatens to deepen the aridity of the high plateaus, transforming them into desert. 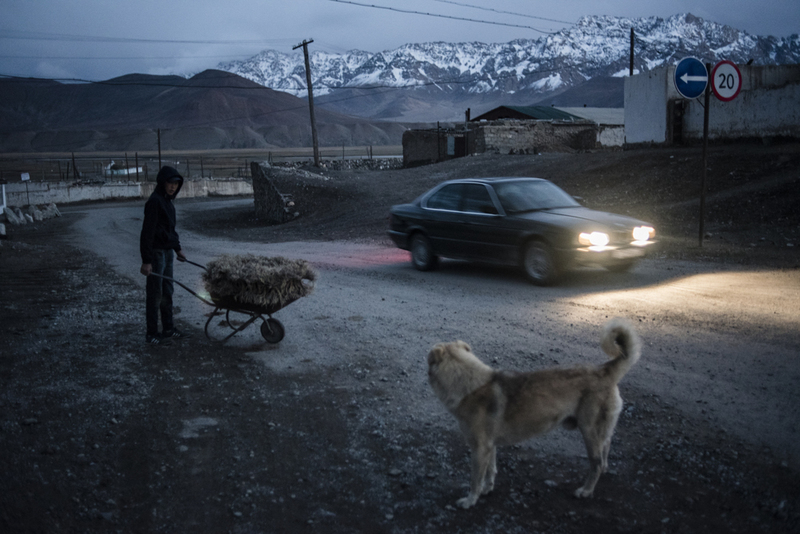 The bulk of the population in Murghab is composed of ethnic Kyrgyz, many of whom migrated to the area in the 18th century. When the republics of the Soviet Union began to take shape in the 1920s, little account was made for the demography of these thinly inhabited spots, which ended up being lumped in with Tajikistan. Residents educated in Soviet times speak a dizzying array of languages, from Kyrgyz, Russian and Tajik to the Pamiri language of Shugnani, and even English sometimes. In the Soviet era, Murghab’s frontier location near China and Afghanistan made it strategically important. A Russian military base ensured the local population was regularly supplied with necessary provisions. There was an area behind the promontory on the southern side of the town used for target practice by the army. The sounds of firing daily rang through the valley. The Tajik military still uses the shooting range, but only around twice a year. Planes flew in daily from the Tajik capital, Dushanbe, 1,000 kilometers to the west. The diesel-fueled power plant ensured households all around had electricity night and day. Some actively sought to move to Murghab because of the plentiful jobs to be found there. The Soviet collapse and ensuing civil war quickly brought an end to an era now remembered fondly. Very little food can be sourced locally at such altitudes. The bulk of groceries are brought in from Kyrgyzstan. A kilo of rice costs 18 somoni ($2); tomatoes, cucumbers, onion and potatoes are around 7-8 somoni a kilo; a bag of flour is 180 somoni; a watermelon is 20 somoni and a melon 30 somoni. 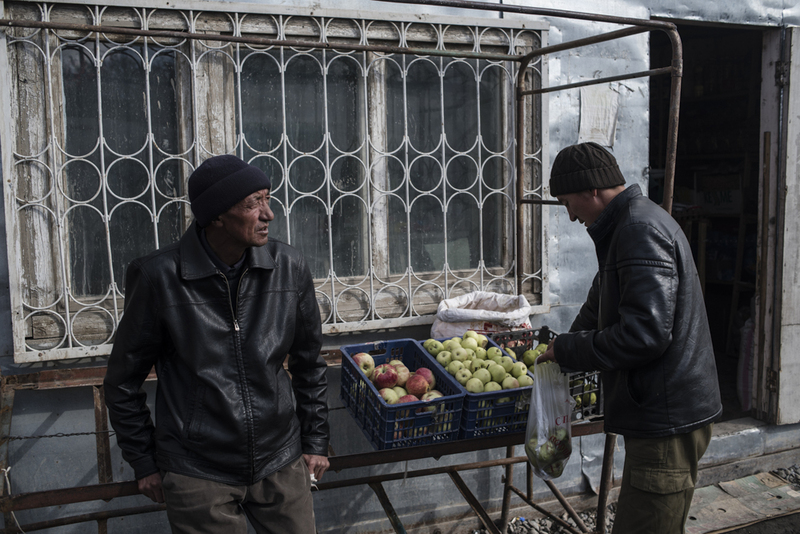 “In Osh, onions and potatoes cost around one-and-a-half somoni ($0.16). But you have to pay a driver to bring it all the way here, so of course the seller adds his share, and he has to pay his taxes. So the prices will go up to 7-8 somoni,” Sultan, a 55-year old who ekes out a living on disability benefits, said in the late fall. Prices would rise further in the winter. Sometimes a fair will pass through from Dushanbe with slightly cheaper goods, but that is only of use to people with cash in hand. “I get a 400 somoni ($45) monthly pension. But it isn’t always certain that I have the money in hand. And when the fairs come, they always want hard cash — you don’t have cash, you get no goods. Local sellers will give you wares on credit, and when I receive my pension I give them the money,” Sultan said. 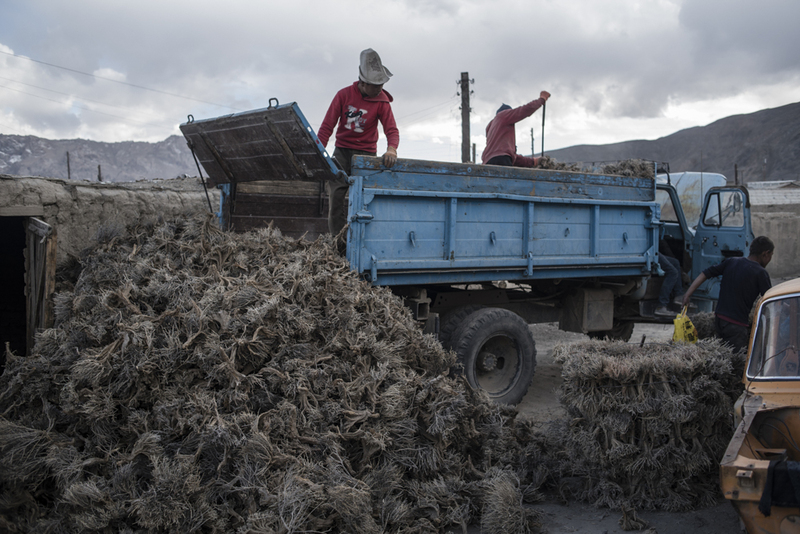 Experiments have shown that it is possible to grow some vegetables in greenhouses in Murghab, but the lack of funding means these kinds of projects typically languish at the test stage. Valiant attempts by locals to cultivate sunflowers and gourds produce scant and anemic results. 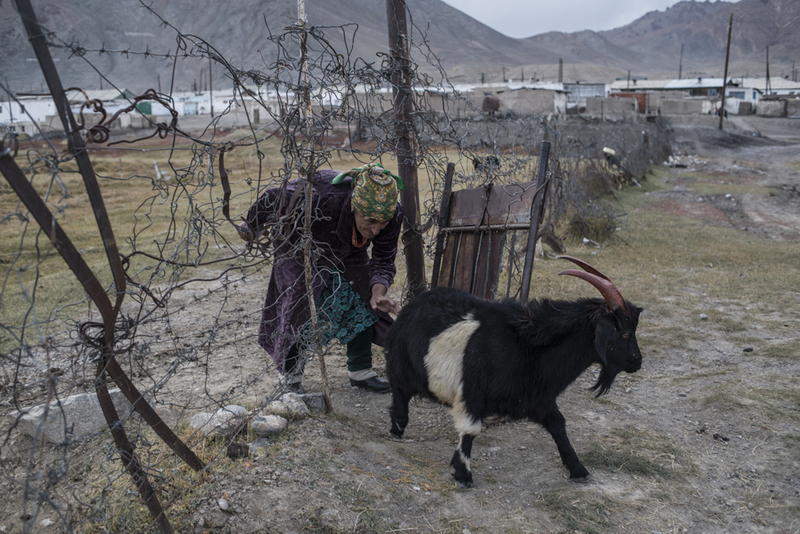 One of the few things in abundant supply is yak meat, which is regularly smuggled across to Kyrgyzstan for hard cash. The way the meat is stored and transported hardly passes muster, but border officials can often be induced to turn a blind eye. 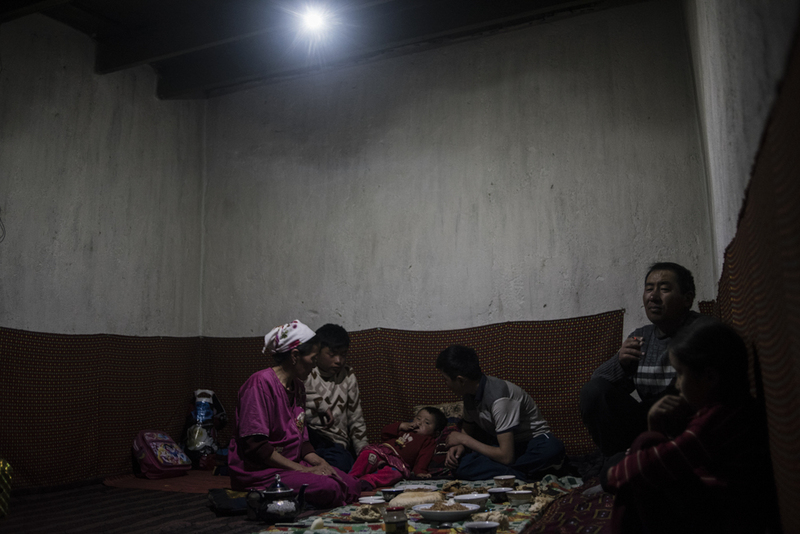 If there were reliable all-year-round electricity, Murghab might be able to build frozen-storage facilities and to start piecing together the makings of at least one solid export industry. “There is a lot of demand for yak meat abroad, in places like Russia. But because we lack the mechanism for export, the yak meat for now costs 29 somoni ($3.20) [a kilo]. Where in Tajikistan do you find meat selling at prices [so low]? Animal hides are sold for similarly miserable prices,” the electricity expert in Khorog said. 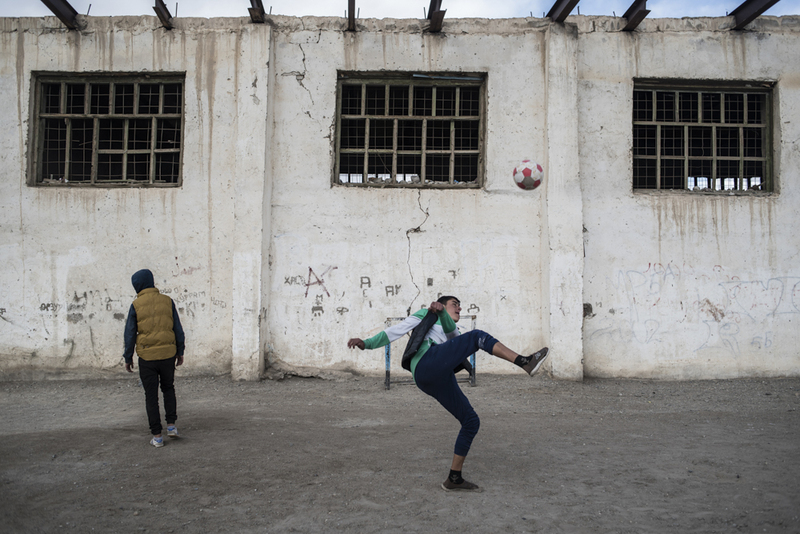 Loyalties to Dushanbe exist but are feeble — loosened by distance and feelings of abandonment. Like every other town in the country, Murghab has a standard-issue billboard bearing the image of Tajik President Emomali Rahmon. It is notably yellowing and dingy, however, in vivid contrast to the reliably whitewashed statue of Communist leader Vladimir Lenin outside the police station. As soon as the Soviet Union collapsed, those with the opportunity to leave did so. 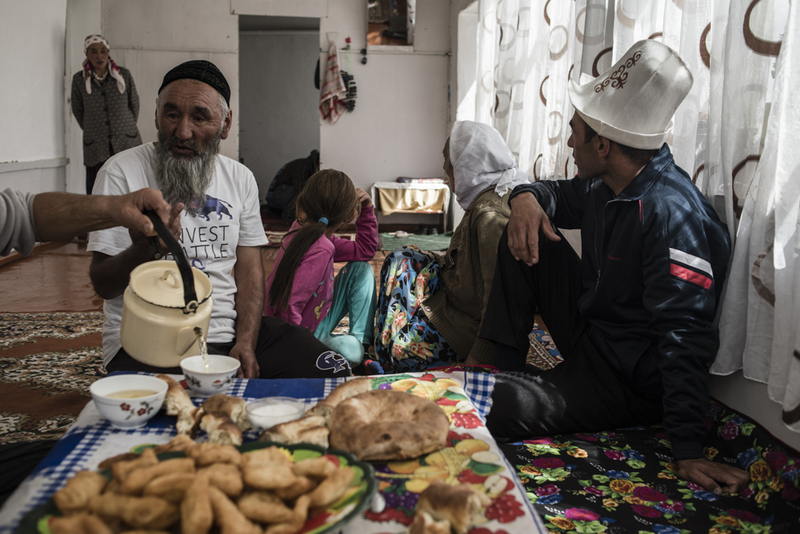 Ethnic Kyrgyz with job prospects — and many of those without them — crossed over the border. In 2004, in a gesture of mutual goodwill, Tajikistan and Kyrgyzstan reached an agreement simplifying the process for people in Murghab to receive Kyrgyz citizenship. But Tajikistan scrapped the arrangement in 2016 after it found that many ethnic Kyrgyz were using the measure to avoid compulsory military service. For all the prevailing hopelessness, there is a little construction going on in Murghab. A bank and the local premises of the Justice Ministry are among a handful of buildings that have gone up in recent times. Not that these operations provided locals any work— the laborers were brought in from other regions. Short-term sojourners count their days in Murghab. After demobilizing, conscripts on border-guard duty leave for home like everybody else, paying a handful of dollars for the uncomfortable ride on a packed minibus. One such group of young men leaving the town early last fall expressed no sadness about departing. 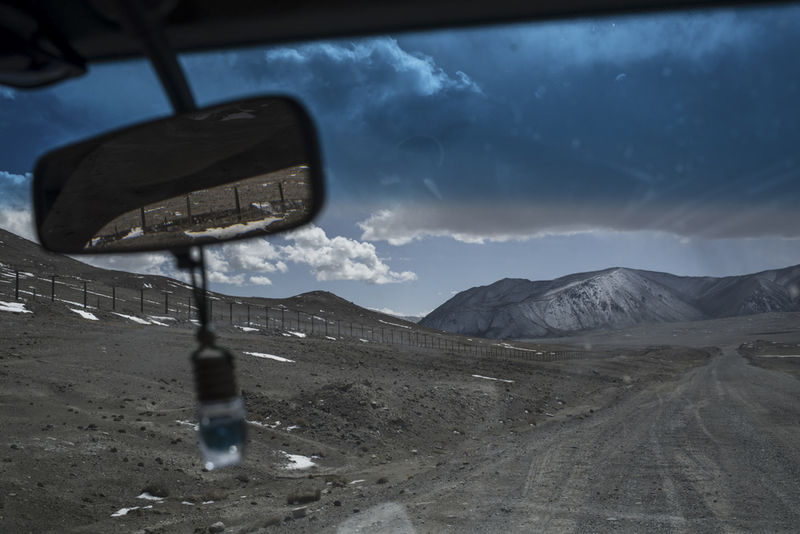 “I wouldn’t wish Murghab on my enemy,” said one young man, his accent betraying his provenance from southern Tajikistan, as the van pulled out onto the potholed road.